GALION — As first days go, this one was a doozy. 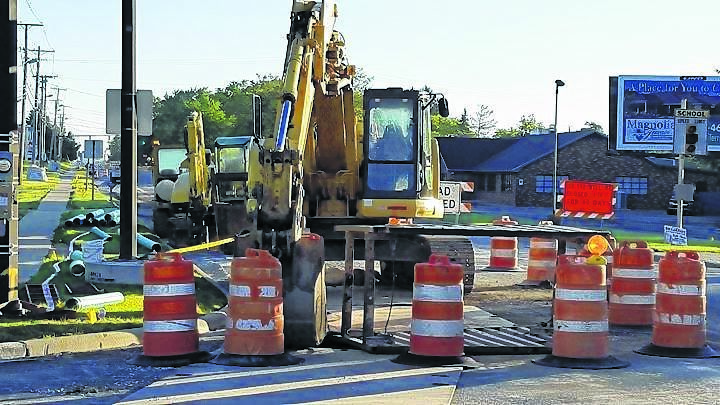 Due to circumstances beyond their control, the City of Galion took a lot of heat Monday for traffic delays and confusion associated with the sewer replacement project on Ohio 598 (Portland Way North). Monday was the first day of road detours and road closings connected with the project that involves replacing a sewer line between Heise Park Lane and Carter Drive. Soon after work began Monday, workers hit a gas line which led to a gas leak in the area. The area around the break is completely closed to traffic while the gas line is repaired. Portland way north — from Heise Park Lane south to the Harding Way intersection — is open to local traffic only. Northbound thru-traffic will be redirected. Access to businesses will be maintained. The Heise Park Lane intersection is also closed temporarily. Traffic in Heise Park must use Jefferson Street. O’Leary said said the leak was the result of an error by Columbia Gas representatives who had marked the location of gas lines before construction work began. While repairs were being made to the gas line, workers accidentally took a small chuck out of a nearby sewer line. “So that added several hours to the the fix,” O’Leary said. By late afternoon the gas leak and sewer leak had been repaired and local traffic in the area returned to normalcy, or what will qualify for normalcy during the two-month Ohio 598 sewer replacement project. Also on Monday, Galion City Schools officials shut the gate that linked Carter Drive with the school district campus. Although it was not a detour route, area residents had been using the campus to get from Ohio 598 to Bucyrus Road. The Galion City School District has made the decision to temporarily close the gates at Carter Drive, next to East of Chicago Pizza, during the construction along Ohio 598. The closure will last approximately 60 days. Also creating problems was the fact drivers going through Galion — including semi-truck drivers — either missed detour signs or ignored then and attempted to go south on Ohio 598 anyway. Once a truck gets past the area of the old Pamida parking lot and Peco Park there is no way for it to easily be turned around, which added more congestion to the area. The City of Galion has decided to place police officers in the area to make sure trucks are turned around before they become a larger traffic headache. O’Leary said the best way Galion-area residents should use marked detour routes. “That’s really the best way for everyone to get around,” he said. O’Leary said city officials had already been in contact with frustrated residents and business owners in the area.